Take an invigorating sip of life with Coca Cola Life, naturally sweetened with stevia and cane sugar! 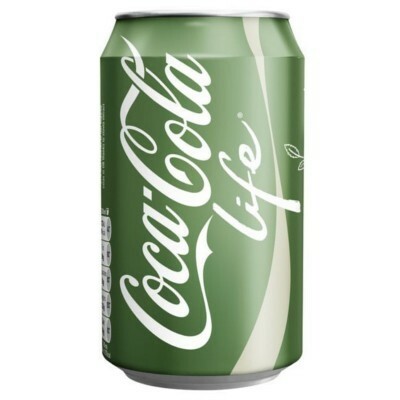 A healthier alternative to the world's best-loved American soft drink, Coke Life comes to you packed with the same delicious cola flavor you have always known and loved. A natural alternative to other Coke products, such as Diet Coke and Coke Zero, this bubbly American soda tastes great with low-fat ice cream for a tasty stevia-sweetened coke float! Carbonated water, cane sugar, color E150, natural flavors, acidity regulator E338, preservative E212, caffeine, stevia leaf extract. Contains GMO. Nutrition facts (for 100ml): calories 25Kcal, total fat 0g (saturated fat 0g), total carbohydrate 6.8g (sugar 6.8g), protein 0g, salt 0g.